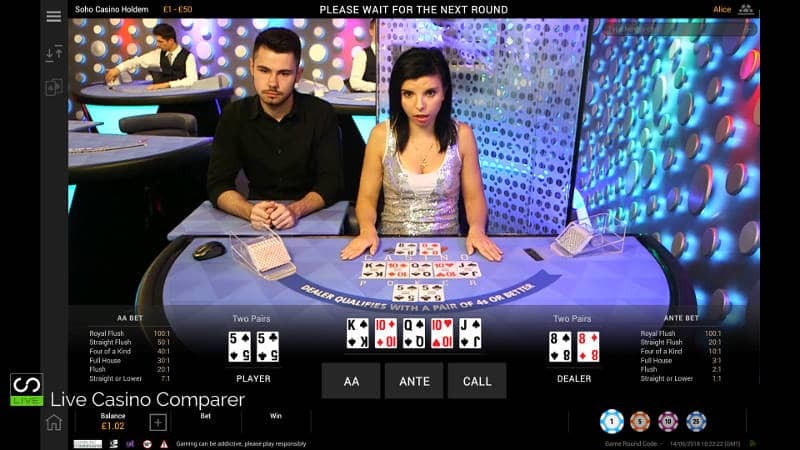 Playtech Live Casino Holdem Review - A choice of two great options. 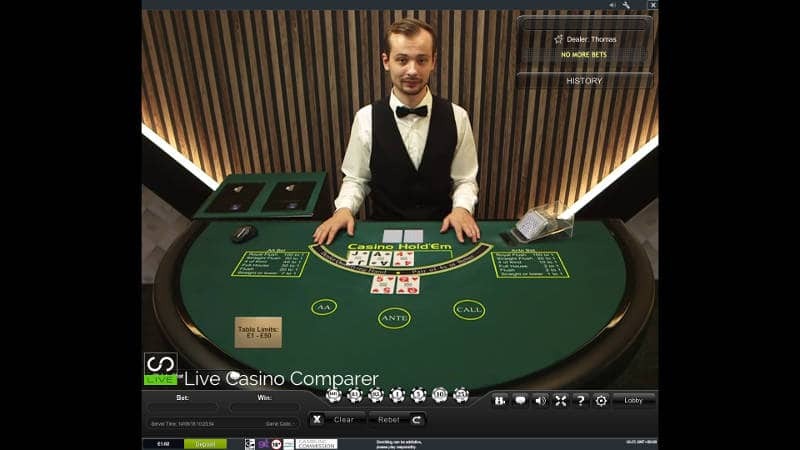 Playtech Live Casino Holdem is a poker based game closely aligned to texash Holdem poker. In fact the game was developed by founder Stephen Au Young, as a training aid for his wife when he was teaching her how to play poker. The version provided by Playetch is the same you’ll find at other live casino providers like Evolution and Ezugi. But, Playetch Casino Holdem is presented in two different ways which gives their version an edge. The game is really easy to play. Having a basic understanding of the value of poker hands does help. The only decision you need to make during game play is whether to play or fold the hand. The objective is to make the best 5 card poker hand you can from two cards dealt to you and the 5 Community cards. An additional AA or Aces & Better side bet adds some extra edge to the game, and will pay out even if the dealer beats you. The side bet result is calculated using the players two cards and the three cards of the flop. 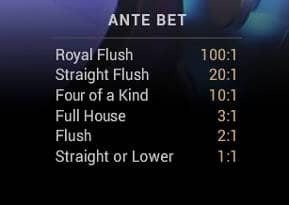 Payouts run from 7:1 for a pair of aces or better, right up to 100-1 for a Royal Flush. Full details of the game rules and how to play can be found on my Live Casino Hold’em review page. Stakes for the game start low at £1, but this is a bit misleading. To actually play a hand you have to place an initial Ante bet. Then if you want to play you place a call bet which is 2x the Ante. This gives a total bet of £3 not a £1. Just something to be aware of. 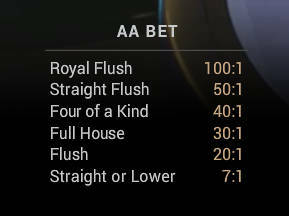 The AA side bet can win you money but only starts paying out if you have a Pair of Aces or better in the first 5 cards. The 7-1 for the lowest hand is pretty good in my opinion, and is really the only way you’re going to win money at this game. The downside is, if the hands are not coming in you’ll lose your bankroll more quickly. Playtech has either by design or by mistake produced a Live Casino holdem solution that offers something for everyone. There are two tables each with different game speeds. The older table using an older playing interface is quick. There’s no hanging about in this game. The dealer uses two shuffling machines to keep the fresh decks coming. As soon as one game is complete the next starts. Great for players that like quick play. The Soho Table, uses the latest playing interface and is in a modern studio. The deck is shuffled by the dealer and then again by a shuffler who sits to the side of the table. Game rounds are slower here, so you get a bit more time to chat with the dealer and see what’s happening. My only criticism is when the game round ends. The cards are whipped away so quick you don’t get enough time to study the result. I’m not that quick in recognising winning hands, so I find that a bit frustrating. Fortunately previous hands can be reviewed from an option in the main menu. Casino Hold’em can be found at all Playtech casinos.